Milan, Sept 2013 | To celebrate the opening of the first Flagship Store Neutra, Milanese jewelry designer Francesca Mo, who works principally with precious materials and stones for her creations, has created an exclusive collection for Neutra combining semi-precious and precious metals with the same stone materials found in Neutra products. 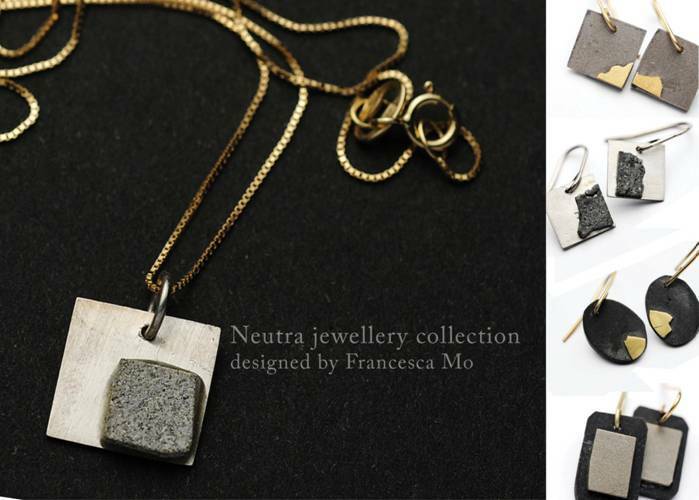 Check out the the jewelry collection online at www.neutradesign.it see the “news” section. Francesca Mo lives and works in Milan. Originally an architect has a new found success in jewelry design. In her previous collection, Clessidre (Hourglasses), presented in 2010, materials such as sand and semiprecious stones’ contained between two thin pieces of glass like in a small desert, moving and shiny, reminiscent of ancient time pieces.